The beer garden “Königlicher Hirschgarten” is named after the recreational park Hirschgarten. As its name indicates, there is a deer park just next to the beer garden. 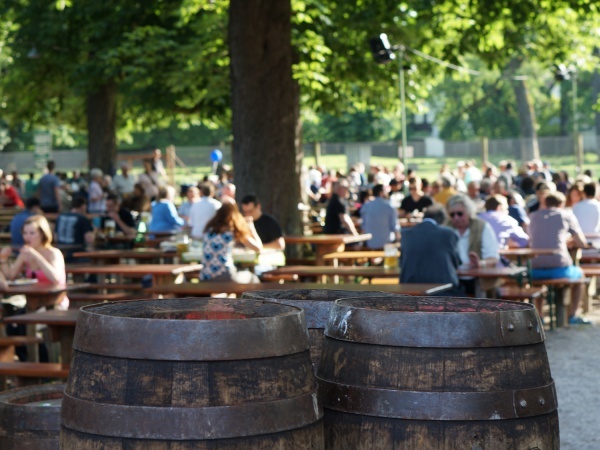 With 8,000 seats under gigantic chestnut trees, Hirschgarten is the world's largest beer garden. A particular tradition includes that beer mugs are washed by the guests themselves! The beer types sold are two light brews; Augustiner from wooden barrels and Tegernseer Spezial Hell. A Maß Augustiner costs €7.10 (April 2018). Traditional beer garden food is available at reasonable prices at the food stalls in the self-serviced area. Highly recommended is the Steckerlfisch from Fischer-Vroni, a grilled “fish on a stick”. An ice cream stall sells a selection of homemade ice creams. Large public viewing screens are set up to broadcast major football tournaments. During the World Cup five large screens displayed the matches to viewers at all 8,000 seats in the beer garden. The beer garden is open every day (weather permitting) from 11am until midnight or on busy nights until latest 1am. Tegernseer Hell review at Bier1.de (in German language). Tegernseer Hell review at BavarianSpaces.de (in German language). Herzoglich Bayerisches Brauhaus Tegernsee at Wikipedia.org (in German language). This page was last modified on 18 May 2018, at 18:58.